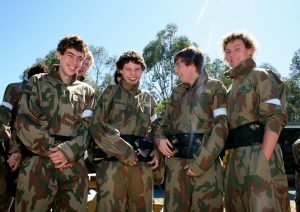 Goggles are the most important and essential piece of equipment for your paintballing adventure. There are various models in use throughout Australia, however at a minimum you will be issued with a goggle that covers your eyes and face. Just as paintball game scenarios have improved from playing behind hay bales and wooden pallets to the now very impressive movie-set props, the paintball goggle has also improved, with a range of paintball centres offering the safer full head protection goggle system. This new and improved goggle system offers complete protection of the entire face and back of head. These goggles will protect your head against the impact of paintballs, enabling you to enjoy your day in greater comfort and safety than ever before. It is recommended that all children under the age of 16 be issued with the full head goggle to offer additional protection. Before entering the game zone your goggles will be touch-tested by a marshal prior to leaving the ‘safe zone’. This ensures that the goggles are appropriately fitted and secured, this removing the risk of potential injury. 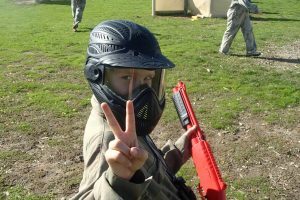 The most important rule for your paintballing day is to never lift your goggles, unless you are in the ‘safe zone’ of the base camp where no paintball guns are present. The goggles are well ventilated and come complete with anti-fog lenses i.e. there will be no need for you to lift your goggles when out in the game zones. Paintball is an extremely safe sport, however serious injuries can occur if you do not follow the safety instructions of the paintball centre.